These main pillars are supported by two cross-cutting activities - Vision, Sustainability and Nuclear Awareness that includes also dissemination, and Management. In order to mitigate the effects of the decline of number of staff qualified in nuclear chemistry, the CINCH-I project aiming at the Coordination of education In Nuclear CHemistry was supported within FP7 Euratom from February 2010 to January 2013. 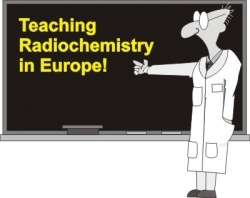 The CINCH-II project - Cooperation in education and training In Nuclear Chemistry - is a Coordination Action supported by the European Atomic Energy Community's 7th Framework Programme (EURATOM FP7 2007-2011) under grant agreement No. 605173 and it will be a direct continuation of the CINCH-I project. The CINCH-II project aims at mobilization of the identified existing fragmented capabilities to form the critical mass required to implement the courses and meet the nuclear chemistry postgraduate education and training needs of the European Union. This dedicated training course aims at delivering the basics of nuclear and radiochemistry (NRC) to trainees with chemical background at Master level (chemistry masters or engineers, and/or freshPhD students), who need to extend their skills and knowledge to the field of nuclear and radiochemistry. This e-course contains the lectures of the Summer School at Chalmers "Working with Plutonium" carried out in May 2015. Participants have to complete three main presentations and final badge test to pass this e-course. This e-course contains the lectures of the Winter School at KTH, Stockholm "Nuclear Fuel Characterization" carried out in January 2014. Participants have to complete three main presentations and final badge test to pass this e-course. Course consists of lectures by Dr. Damian Axente, University of Cluj, Romania, which are divided into four slideslive video-presentations. A participant must see all four slideslives to pass the course and pass a final test in order to gain the Isotope Separation badge. The purpose of this course is to provide an overview of the applications of nuclear and radiochemistry (NRC) in analytical chemistry to NRC master and Ph.D. level students and/or analytical chemists without NRC background working in radioanalytical laboratories. Complex of lectures by Eric Ansoborlo (CEA) on chemistry of radionuclides and their speciation in the environment. Základní kurz radiační ochrany pro účastníky různých laboratorních praktik na katedře jaderné chemie, FJFI, která probíhají ve sledovaném nebo kontrolovaném pásmu. Kurz je primárně určen pro externí účastníky. to contribute you must register as a user (it's free and we will not distribute your e-mail address to others). We strongly urge you to contribute, in particular if you are using material from NukWik in your own teaching - the more material you contribute, the more useful and better NukWik will be, and then we can all give better lectures and enhance the quality of our teaching! Deliver scientific knowledge on material science (formulation, preparation, characterization, long-term behavior) for waste conditioning. The "Sand Box " course is the good place to make all the test and experiments before editing a course. Throughout the course indicators are provided to the Moodle Course Creator Certificate (MCCC) Skills Sets - so the course is ideal for MTC candidates.